Today it’s time for the 19th installment of Conner’s Closet!!! I can’t believe we’ve been doing this for over a year and a half now. Thank you Conner for all of the incredible WORK WEAR ideas that everybody gets so excited to see every month! You GUYS! I literally jumped up and down whenever I tried on this outfit for the first time. It made me THAT happy! 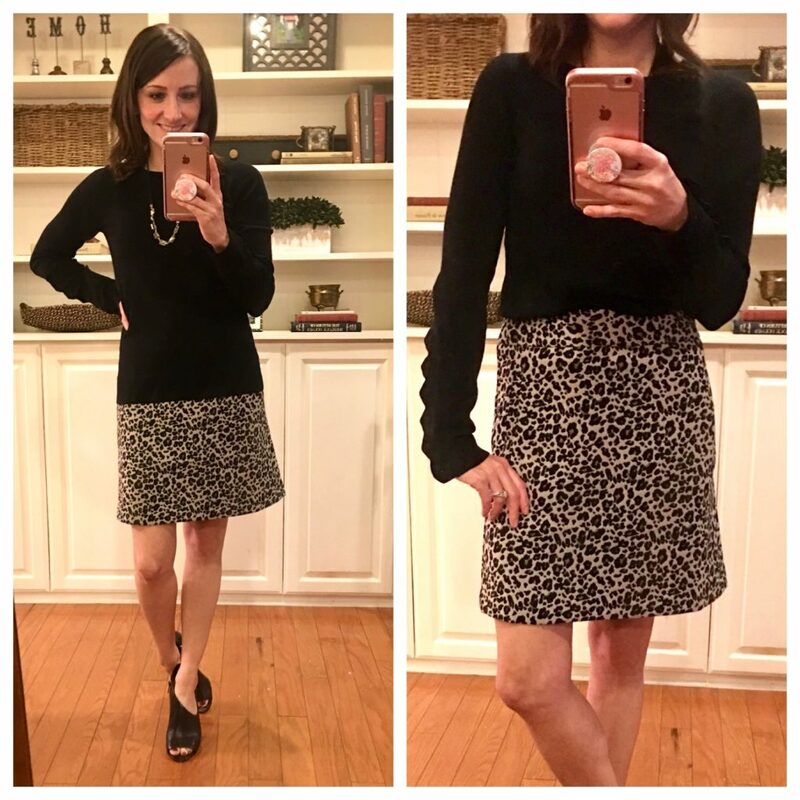 This outfit combines two of my favorite things…leopard print AND scallops. I will definitely wear the sweater with jeans, too! I wore this outfit to work last week and received a ton of compliments. I usually prefer to wear my shirts and sweaters tucked in, but I love the un-tucked look, too! The sweater has a band at the bottom, so it still looks stylish and professional even when you wear it un-tucked. I recommend the Careeta pumps, but you can also wear flats or even tights and boots when it’s cold! 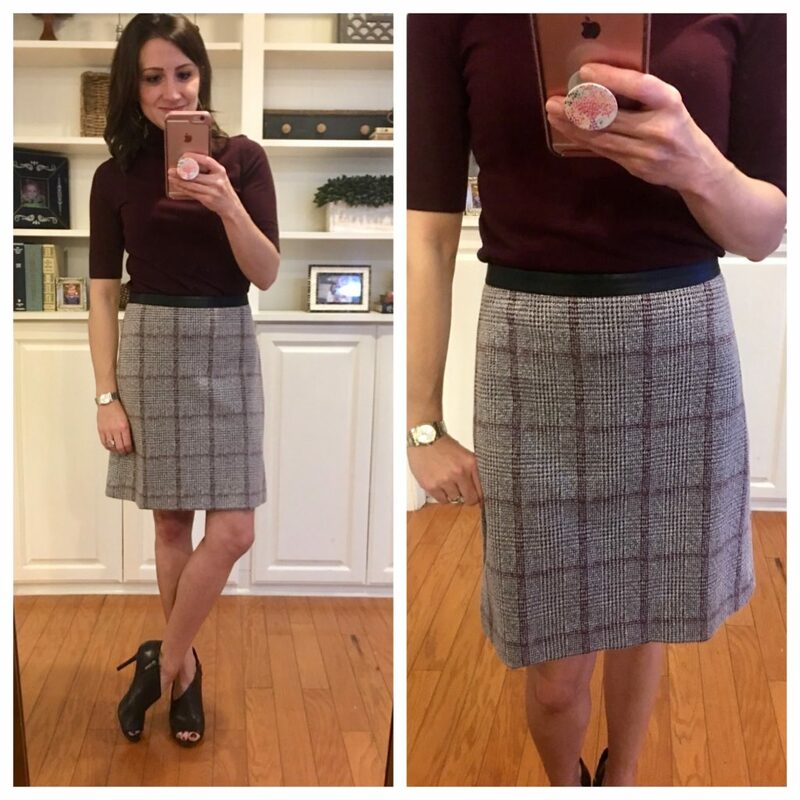 The sweater (XXS reg) and skirt (00 petite) are true to size and machine washable, but I recommend laying both pieces flat to dry. Conner! The scallops! OMG! And I love that the sweater also comes in grey, olive, and a gorgeous ruby red (that would be perfect for the holidays). And the skirt? So. Much. Fun. Calling all shift dress lovers – I’ve found the perfect fall dress! 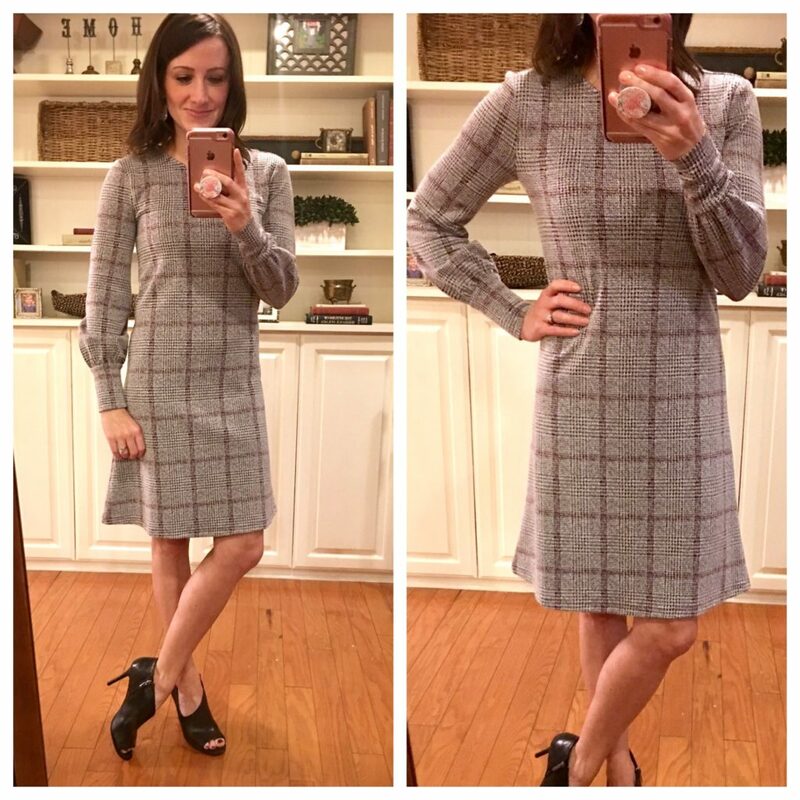 I love, love, love this dress and everything about it – the shape, the fit, the subtle plaid, and the sleeves with shirred cuffs! This is one of those dresses that can be worn to work during the day and then dressed up for an evening out. The material is super soft and not at all restricting. It’s a great choice for anyone who has to travel. I recently packed the dress for a business trip to Ohio and didn’t even have to iron it after taking it out of my suitcase! I’m confident this dress will look great on multiple body types – it has a little bit of stretch and is very forgiving. I’m wearing the Careeta pumps again. I highly recommend wearing a slightly “edgy” shoe since the dress has a traditional look. I sized down in this dress due to the fit. I’m wearing an XXS Petite and the shoes are true to size (5.5). The dress is machine washable (but definitely wash on cold!). I dried the dress in the dryer, but recommend hanging or laying it flat to dry. You know I love a shift dress, Conner….so you are speaking my language with this one! And the fact that it’s stretchy and doesn’t wrinkle? SIGN ME UP! And fyi: Conner isn’t the only one who loves this dress. It has near perfect reviews on the site. I know what you’re thinking… “Isn’t that the same plaid print of the dress?” Why yes, yes it is. #sorrynotsorry #iloveplaid #youshouldtoo. 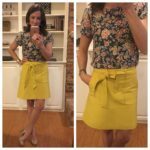 How great is the skirt with the leather trim?!? I LOVE it. The skirt is very affordable, but the details give it a designer look! And the skirt goes perfectly with this elbow sleeve turtleneck sweater in vintage burgundy. The same pumps look great with this outfit, but a bootie or a knee high boot would also be super cute! The skirt (00 Petite) and blouse (XXS reg) are true to size and machine washable and I will lay them flat to dry. Well, I LOVE this skirt. I love the material, I love the cut and fit, and I love the thin leather band at the waist. I love it all. I’m also obsessed with your edgy heels and think they pair perfectly with all of today’s outfits! The sizes are perfect over in the heels, but they’re a great deal, so maybe you’ll get lucky! You guys know I love a good wrap dress and this one is beautiful! The pictures don’t do it justice. I am a huge fan of the blue and black color combination and this dress has only furthered my obsession! The details are fantastic and the sleeves have slit button cuffs – I die! The dress is form fitting and I recommend wearing a black cami and a half slip underneath to prevent any wardrobe malfunctions. The dress is super comfortable and versatile – you can wear it to work or to an evening event! I’m wearing the same pumps again, but you could also wear it with a strappy or chunky heeled sandal. The dress (XXS reg) is true to size and machine washable. I recommend hanging the dress to dry. 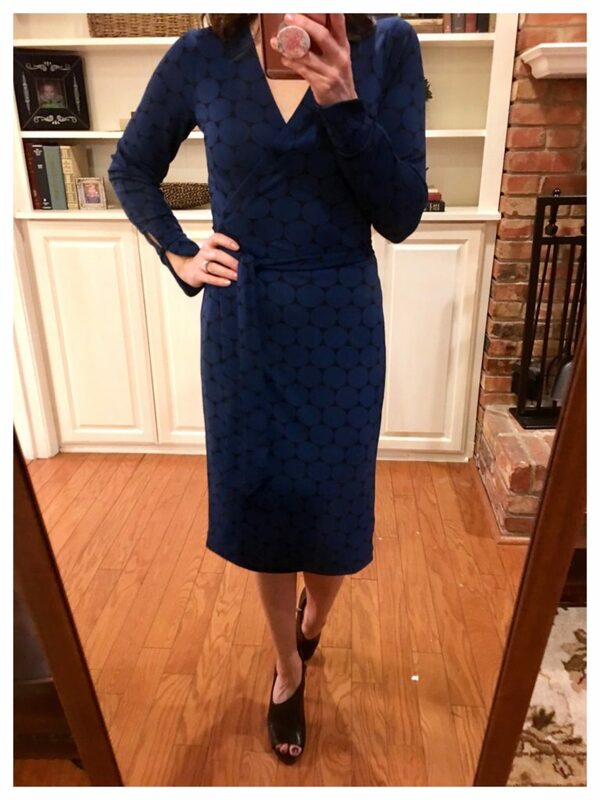 You always look so good in a wrap dress, Conner! I don’t think I’ve ever owned one, but I need to fix that asap! They look so comfortable! I mentioned on Facebook last week that my sister had this sweater, and several of you asked if she would show herself wearing it! Isn’t it great? She has in the blush, but it comes in 6 total colors. 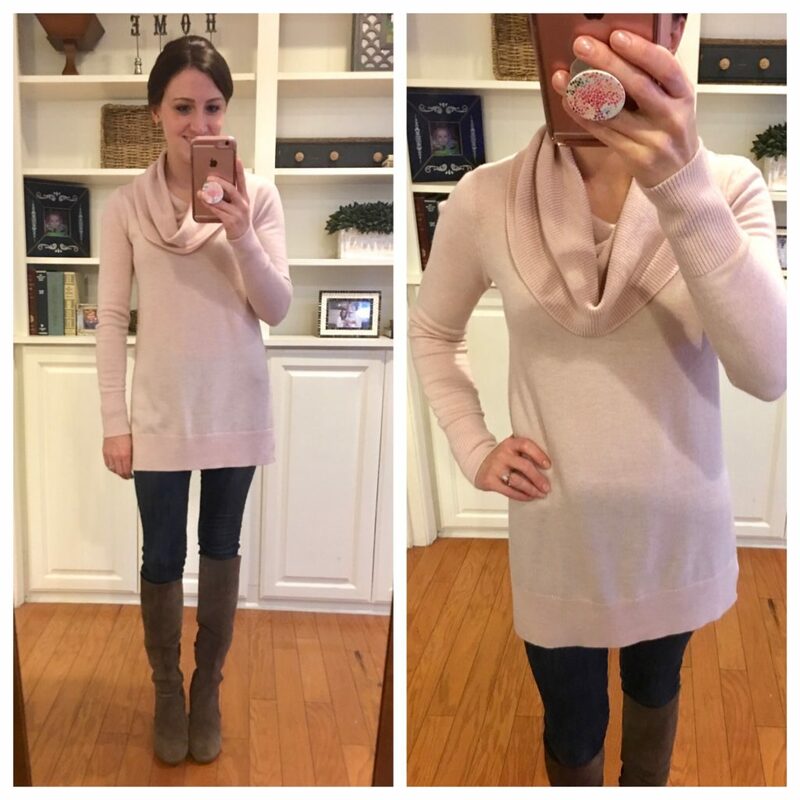 So many readers commented that they have and love this sweater, and 1 reader (Shout Out, Shellie!) admitted she has it in 5 colors!!!! It obviously looks great with jeans and boots, but it would also look great with work pants or a pencil skirt with a 1/2 tuck. And because I saw that a couple of pieces she featured on her last post are still available and ON SALE, I thought I would repost them again! I absolutely love this outfit, but the pictures don’t do it justice. The white, green, and pink (in the earrings) color combination is perfection! This blouse is to DIE for. The ruffle stand collar, button cuffs, and gathered back are so feminine. I believe these pants are new to Loft and let me tell you, I’m a fan. Right now, they only have them in green and black, but believe you me, I’m going to lobby for them to make them in every color. The pants have side slits and also zip on the side. They sit higher on the hip than the typical Marisa pants and seem to have a slimmer fit – I’m wearing the 00 petite, but would probably be more comfortable in a 0 petite, so depending on how you like your pants to fit, you may want to size up. Both the pants and top are machine washable and I will lay them flat to dry. I love the white, pink, and green combo too….AND THE ADDITION OF THE LEOPARD SHOES WAS SO SMART. Such a great look! Since Conner’s shoes are old, I wanted to give y’all some options! If you’ve been reading here for awhile, you know I’m a big fan of a leopard shoe. Personally, I own these flats (I’ve had them for about 4 years and still wear them all the time! ), these slides, and these booties. 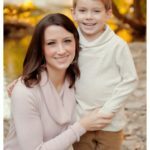 Your outfits are all DARLING, and I know there are lots of working women out there who appreciate these posts so much! Love you, sister! Hello! I would love to know the style and name of the boots that Conner is wearing with the blush turtleneck sweater. I have small legs and have trouble finding knee length boots that actually fit. Thanks! I already had purchased the ruffle utility blouse and I’m so excited as I know I’ll be able to wear it with so many things. However, I’m nervous about the Viscose fabric. I already washed it once (dried flat) and it is pretty wrinkly, and a cool iron didn’t do great on it. Any tips on managing Viscose fabric shirts? 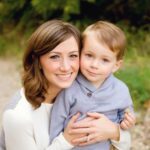 Hi, Kaitlin! Can anybody comment on this with some tips? 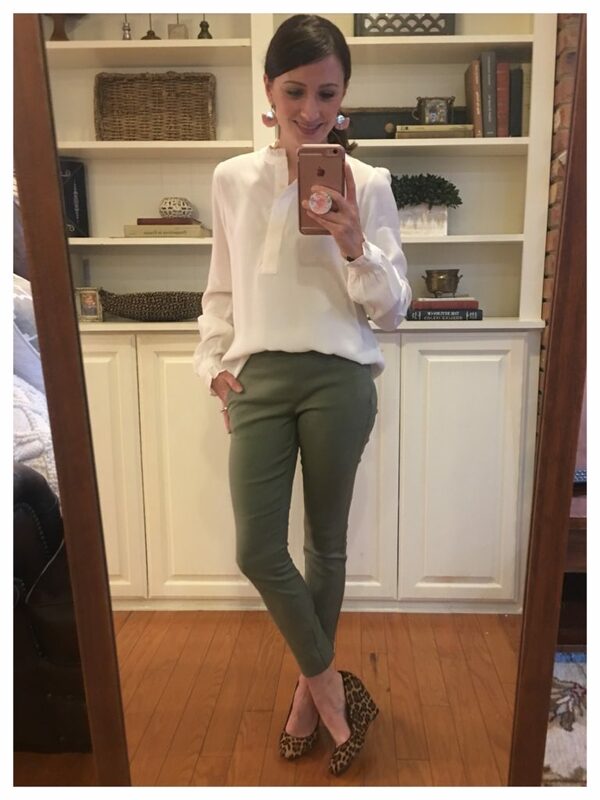 I LOVE Conner’s work wear posts – I almost always find something I just have to have. I will say though – I bought that cream ruffle collar blouse and find it gets SO WRINKLED. To the point where I’ve stopped wearing it because I’m a wrinkled mess an hour into the work day. 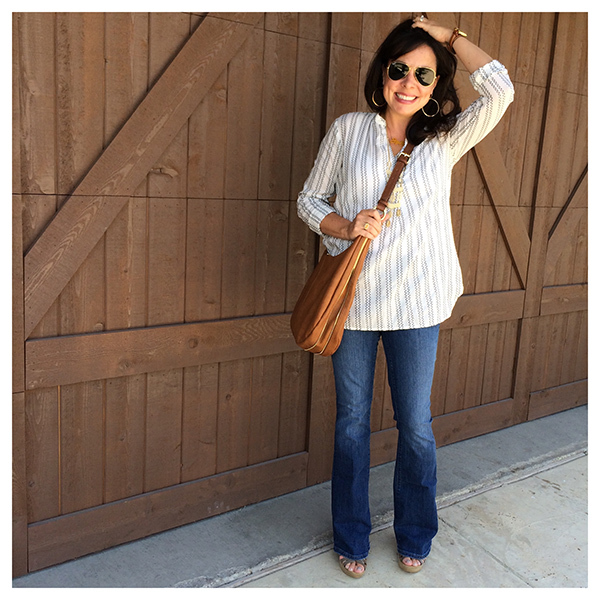 I usually love Loft’s blouses and find they wash and dry wrinkle free (or with minimal wrinkles that can be released with a little Tom & Sheri’s! ), but the wrinkles in this blouse are just out of control. Such a bummer because it is seriously adorable with the ruffles.